If the temperature is too low, plastic material may be not melt completely or flow poorly. Generally, there are 3 ~ 5 heating zones on the barrel of injection molding machine. The temperature of the zone which is closest to the hopper is lowest, then the temperature keep increase after it. The temperature of nozzle zone should keep same. The Actual melt temperature is usually higher than the set temperature, because the effect of the back pressure and the friction heat caused by the rotating of the screw. Ask the plastic material supplier for the suggest temperature of the mold temperature. Mold temperature can be measured by thermometer. If the mold temperature is 40~50℃ or above, need to consider to add the insulation plate between the mould and mold platens of injection molding machine. In order to improve the surface quality of the product, sometimes need high mold temperature. Injection end position is the screw position where it change from injection stage to pressure holding. See below picture. If the padding material not enough, there may be shrinkage mark on the product surface. Generally, the length of padding material set at 5~10mm. Generally, set the injection end position as 2/3 of filling full of the mold cavity. It can protect the injection molding machine and the mould. Suggest back pressure value is 5~10Mpa. Lower back pressure will increase the time that the material stay inside the barrel. Set injection pressure as the Max. value of the injection molding machine is for better using the injection speed, so pressure set won’t limit the injection speed. Before fully filling the mold cavity, the pressure will change to pressure holding, so the mold won’t be damaged. Set the pressure holding valve 0Mpa, then the screw will stop when reaching the injection end position, which can protect the injection molding machine and mould. When using the Max. injection speed, can achieve lower flow resistance, longer flow length. But need to set the air exhaust holes. If the air exhaust is not good, it will cause high temperature and pressure on mold cavity, then cause burning mark, material degradation and short shooting. Additionally, need to clean the mould surface and the air exhaust position regularly, especially for ABS/PVC material. The ideal pressure holding time should choose the Min. value between the sprue solidification time and product solidification time. Regarding the 1st trail, can use the CAE software for forecast the mold filling time, then set the pressure holding time as 10 times of this filling time. Cooling time can be estimated or calculated, it includes the pressure holding time and continue cooling time. At the beginning, can estimated the continue cooling time 10 times of the injection time. For example, if estimated injection time is 0.85s, then pressure holding time is 8.5s, and extra cooling time is 8.5s. by this way, it can make sure the product and runner system solidification enough for ejecting. Generally, the mold open time can be set 2~5s, including mold open, ejecting, mold close. The cycle time is the sum of injection time, pressure holding, continue cooling time and mold open time. The weight of product,runner and sprue and be measured by CAE software, then according to the screw diameter and inner diameter of barrel, the each injection capacity and starting position can be calculated. So only filling 2/3 of the mould cavity, pressure holding set 0Mpa. The screw will stop when reaching the injection end position, mold filling will be sopped. So it can protect the mould. After that, increase 5~10% step by step, till filling 95% of the mould cavity volume. The purpose of automatic running is for achieving the stable of the production. Mold open stoke include height of mould core,product height,pick out space. See below picture. We should set a shorter open stroke. The starting speed should be low when mold opening, then speed up, and slow down before ending. Mold close is similar to mold open, should be “slow-fast-slow”. First, remove all the sliding, Max. ejecting stroke is the height of the mold core. If the injection molding machine equip with hydraulic ejecting device, then set the starting position at the position where the product can be take out from the fixed mold. 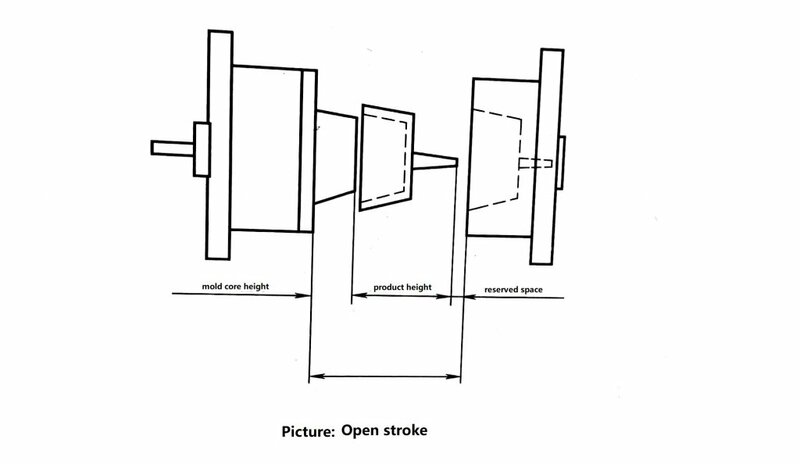 If the ejecting speed is same to mold open speed, then the product stay at the side of fixed mold. When the parameter is fixed (get same part every cycle ), adjust the injection end position to be the 99% of the mold cavity. Increase the holding pressure step by step, increase 10Mpa every time. If the mold cavity is not filled full, need to increase the injection volume. Choose the acceptable Min. pressure value, which can decrease the pressure inside the product, and save ram material and decrease the production cost; big holding pressure may cause the inner stress, it will affect the shape of the product. If padding material used out, then the last phase of pressure holding can’t work. It will need to change the injection starting position for increasing the injection volume. The most simple way to get the shortest pressure holding time is to set a long pressure holding time at the begging, then reduce it little by little until the product has shrinkage mark. Reduce the continue cooling time until the surface temperature of the product reach the hot deformation. 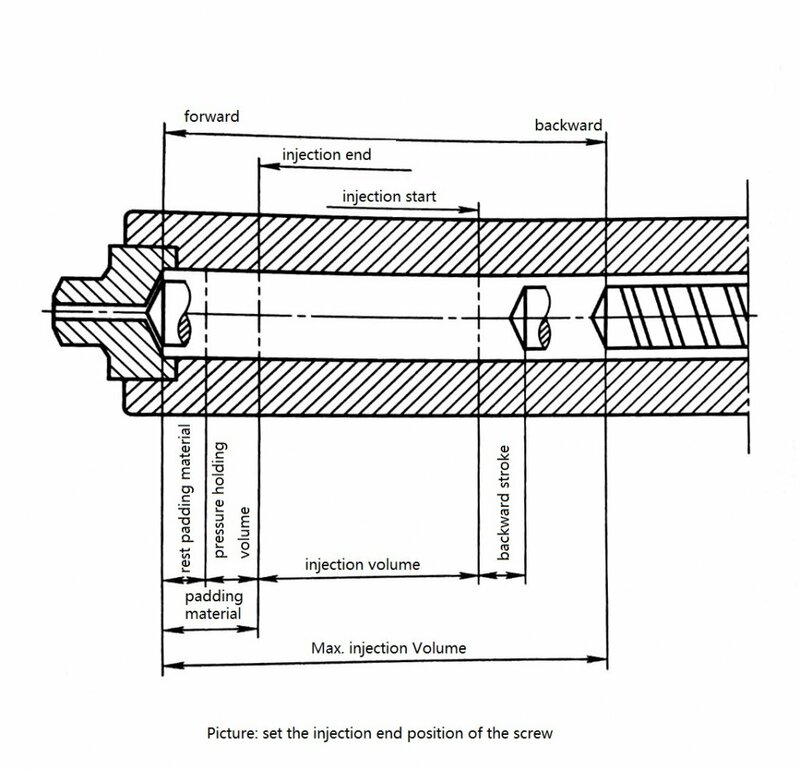 Speed: set injection speed from slow ; set screw rotating speed from low; set mold open/close speed slowly at first; injection volume from small position. Time: set long pressure holding time of injection molding machine at first (ensure sprue closed); set long cooling time at first.